Team talk. Instead of attending Dartford vs Hampton and Richmond as initially advertised, we packed our bags and headed off to The Valley for Exeter’s visit to Charlton. In a week where UEFA announced that the cheapest ticket for this year’s Champions League Final (to be held at Wembley in May) would be £125 plus a hefty £26 admin charge, it seemed only fitting that we went to another of London’s premier sporting venues: The Valley. Instead of a hefty three figure sum, we would be treated to 90 minutes of League One action for just £5. Granted, it was unlikely that we’d witness a display befitting the zenith of the sport we love, but it was hard to turn down football for a fiver. This bargain price came courtesy of Charlton Chairman Michael Slater who, like many executives is struggling to keep his club’s supporters coming back every other week. Shrinking attendances in football grounds across the country is a big issue, none more so than in populous locations such as London where the choice is massive. 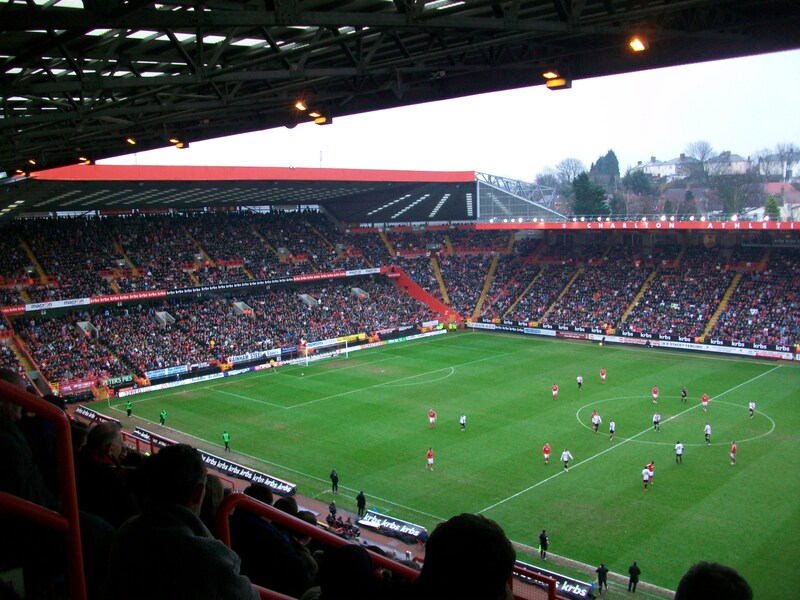 Since Charlton’s heydays of Premier League football when the average attendance was consistently over 26,000 (quite a feat considering the ground’s capacity is just 27,111), The Valley has struggled to get fans through the turnstiles. This season has seen the average attendance slip to around 16,000, down nearly 40% on 2006-7. Thousands of column inches and web-pages are dedicated to the subject of dwindling attendances and therefore, I’m loathed to repeat what’s been said a million times before. In my opinion, I suppose most people simply won’t pay £2o to watch a standard of football they deem inferior to what their £50 a month will get on their Sky box. It’s sad but at present, it’s seemingly unavoidable. Park the bus. Access to The Valley via public transport couldn’t be easier. Train services run every 10 minutes or so from London Bridge to Charlton Station and takes 15 minutes. If you’re lucky enough to already be resident in South East London, there is a limited service from Lewisham via Blackheath which operates every 20 minutes and takes less than10 minutes. The Ground is a brisk 5 minute walk from the station. 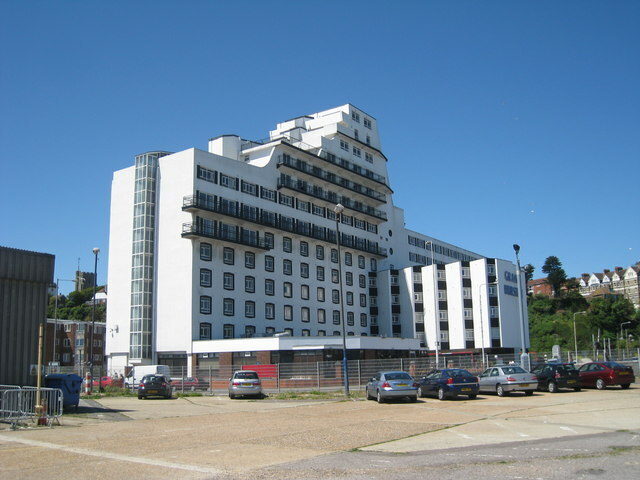 Charlton also offer a coach service from a huge number of locations across the South from as far away as Dover and Worthing. If you’re traveling by car, firstly, shame on you and secondly, good luck as there are very few formal parking spaces available. Parking restrictions in nearby streets severely restrict on-street parking. I suspect the nearby retail park will have equally stringent rules, however, it might be your best punt. Home advantage. 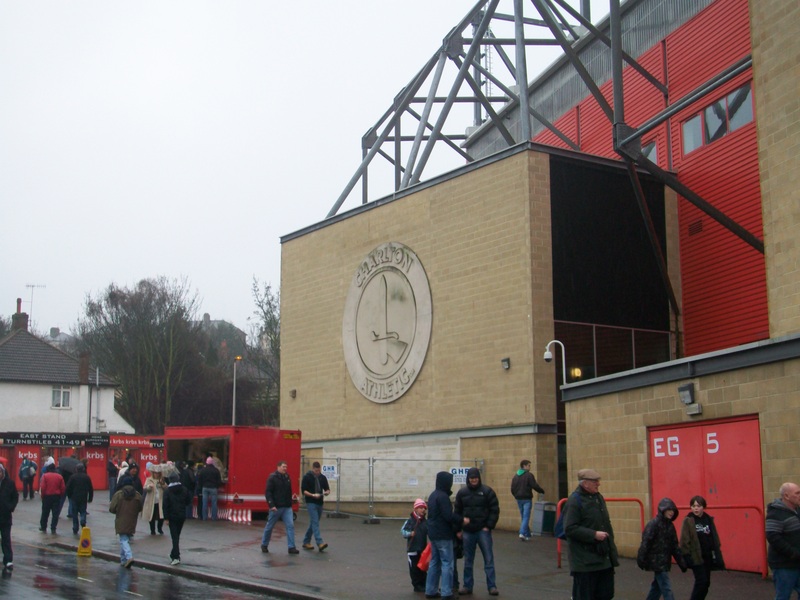 The site of The Valley has been home to Charlton Athletic since 1919. A brief absence in the 80s saw them ground sharing with the Rigsby-esque landlords of South London, Crystal Palace. Their return to the Charlton area in 1992 was followed by promotion to the Premier League in 1998 after playoff success in one of the most exciting play-off matches I can remember. The Valley offers good views of the pitch with virtually no obstructions in any part of the ground. From our seats at the back of the West Stand, we had a near perfect view of the game. It’s a simple yet effective stadium that hasn’t resorted to the utilitarianism style seen in many late-80s/early 90s stadia and the new (well, 2002) renovation of the North Stand has created an excellent amphitheatre which really added to the atmosphere, especially when the crowd were in full voice. If I was to fault The Valley at all, I’d say that staggered development/redevelopment of the ground looks a little disjointed, but that’s to be expected and is certainly not the worst I’ve encountered, nor does it particularly impact on supporters. In terms of points of interest within the ground, I was particularly taken by the ground’s communications suite, the only real carbuncle within the stadium. This sits awkwardly between the Jimmy Seed Stand and the West Stand and unfortunately seems to be modelled in the bold (and appalling) architectural style of the Grand Burstin Hotel in Folkestone, a hotel modelled on a boat. So to have a media room modelled on a hotel, modelled on a boat seems totally demented. The crowd seemed like a friendly and knowledgeable lot, there was no pointless braying for decisions which the officials had clearly got correct and the occasional volley of the always welcome “Come on you reds”. Oh, how I love a classic. It is worth noting to the easily irritated, that there is a chap with a drum in the North-west Quadrant somewhere, if you like you football drum-free, avoid the Quadrant! Outside the ground there was the usual cacophony of burger vans as well as a neatly stocked club shop which seemed to be doing a fine trade. There is a pleasingly colossal club crest over the turnstiles. 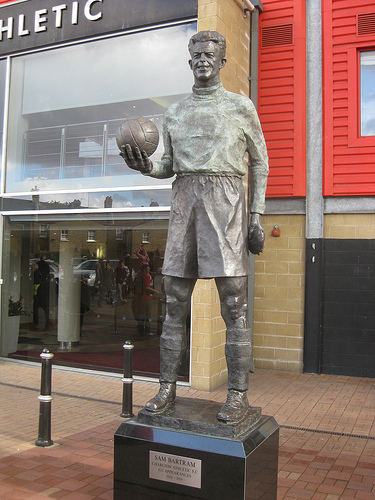 In front of the main stand stood a giant (hopefully lifesize) statue of Addicks legendary goalkeeper Sam Bartram. Oddly he appears to be holding both a football and a Gregg’s pasty. Prawn sandwiches. Within the ground, there was the usual offerings of tea, coffee, Bovril and pies but we chose not to partake in any of it as the best action was most definitely pre-match in Bartram’s Bar, The Valley’s built-in pub at the bottom of the West Stand. This was a great wee facility adorned in memorabilia and provided a welcome refuge from the elements. We spent a fun-packed hour in Bartram’s watching Chelsea vs Everton and learning about Charlton Athletic, including two great facts: 1. The nickname “Addicks” originated from a local fishmonger who used to reward players with a Haddock (or in Sarf Lahndin: “Addick”) Supper after every game and 2. Richard Rufus is a two-time player of the year for Charlton. Shocking. Alas, there was no evidence of a Bartram Pasty on sale anywhere. …and the game. Charlton look like a side that is going places, 3-1 is massively deceptive in what was an excellent performance from the Addicks/Haddocks. It goes to show you what good counter attacking football can do. Exeter were far more technically proficient than I expected and looked pretty decent, however, their defence never looked comfortable. I was pleasantly surprised to discover that Brockley native and former Hillyfielder, Bradley Wright Phillips has found his form. Everything Charlton did went through him and he deserved his goal. Charlton endeared themselves to me no-end by adopting my Football Manager formation of 4-2-1-2-1, unfortunately for them, where I have Andre-Pierre Gignac, they have Pawel Abbott. In the long term, this is going to be an problem for them as he is no lone striker. Luckily in a side which also sports Christian Dailly, Pawel will never look like the worst player on the park. Today’s result was no real surprise, this was Exeter’s cup final, bar a trip to St Mary’s this is one of the biggest crowds they’ll see all season. I’m not surprised they were up for this, having said that the strength of Exeter’s victory will have undoubtedly rocked Charlton, the biggest test will be how they respond. Man of the match. Without a doubt this has to go the Charlton chairman Michael Slater who will have taken a massive financial hit this week. Nonetheless the sound of 24,767 supporters in his stadium will no doubt make him very happy. No club will be able to sustain ticket prices at this level but the announcement that the club are going to knock £50 off the price of all season tickets next year will hopefully encourage some supporters to come back for good. If Charlton go up (and despite the result today, I suspect they might) £240 for the year is an incredibly good deal. After all, it’s less than two tickets to the Champions League final. Post game rub down. It’s a shame Charlton didn’t deliver, it’s always going to be easier to get people back if they go home after a victory, however, in the words of Walt Disney: “always leave them wanting more”. 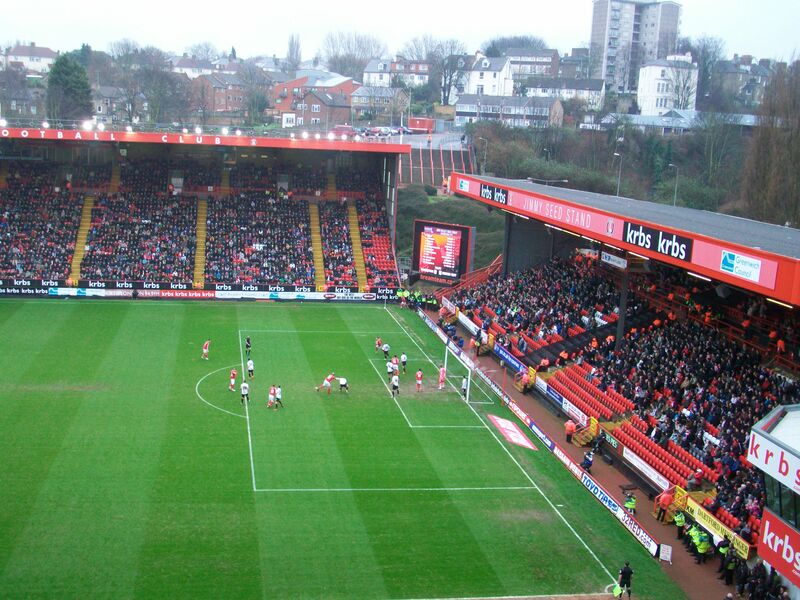 On today’s evidence, Charlton’s fan-base still exists, it just need coaxing out of the woodwork. 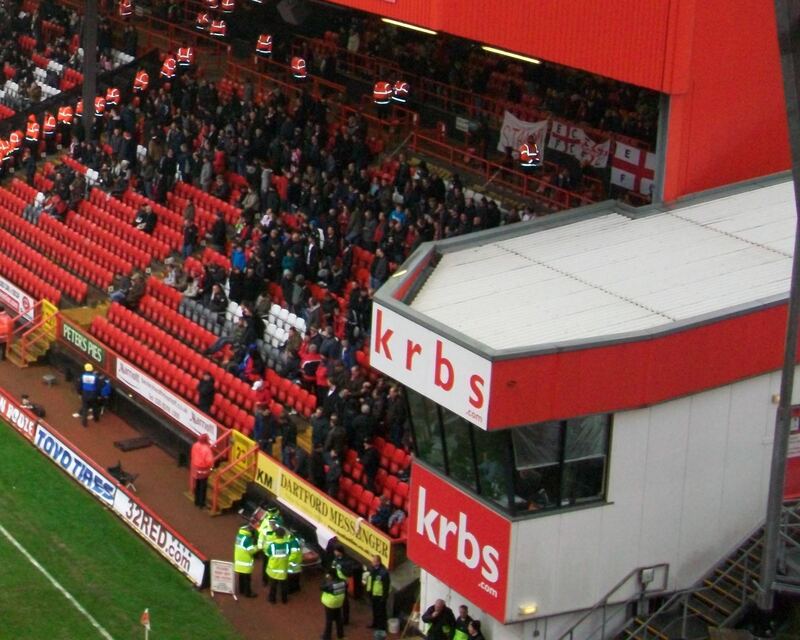 Charlton are a big club, make no mistake. They carry themselves with the knowing swagger of a Premier League club. However, there’s a humility which has come either as a result of a double-relegation or failing to re-establishing their position in the Championship last season. What struck me most was the strong sense of community at the club. At a non-league outfit, that’s second nature but I’ve not seen it in such prevalence at a league club before. I suppose that when you’ve had the rough ride that they’ve had over the past few seasons, it’s hardly surprising.